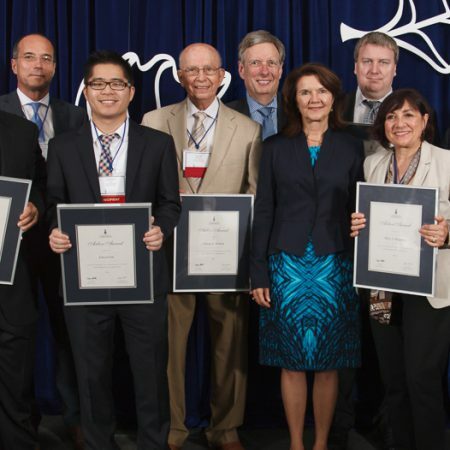 U of T Engineering's 2014 Arbor Award winners (L to R): Larry Tricinci, Constantine Karyannopoulos, Edward On, George Wildish, John Weber, Dean Cristina Amon, Paul Anderson, Mary Ruggiero and Shahir Daya. Absent: Donald Dowds, Betty Yi-Shing Lin and Thomas Woods (Photo: Gustavo Toledo). For the better part of six decades, alumnus Donald Dowds (MechE 5T3) has been giving back to U of T Engineering. As a member of multiple awards committees, the host for many student recruitment events and an organizer of the Skule Lunch & Learn speaker series, his personal service to the engineering community is exemplary. Donald was one of 11 remarkable U of T Engineering alumni that were recognized at the 25th annual Arbor Awards on Sept.10 at The President’s Residence. Created by U of T in 1989, the awards are presented annually to alumni and friends whose loyalty, dedication and generosity has added substantially to the quality of the University of Toronto experience. Paul has volunteered at Hart House Theatre since 2001, overseeing the theatre’s transition to online ticket sales in the early 2000s. Without his leadership and expertise, Hart House Theatre would not have served its audiences so well over the past 12 years. Shahir has been an active member of the Alumni Mentorship Program since it was founded in 2005. He has gone above and beyond in this role by continuing to mentor students long after graduation. Recently, Shahir volunteered to become a co-chair of the mentorship program, which has flourished under his leadership. At last count, more than 90 engineering students have been paired with mentors. 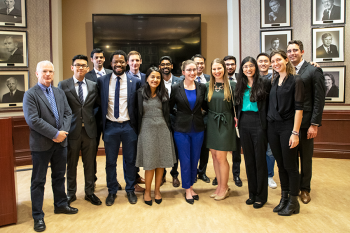 Donald was the president of the class of 5T3, a dedicated and enthusiastic class that embodies the spirit of “paying it forward” to future generations of U of T students through scholarships and awards. An active volunteer for more than six decades, Don has served on awards committees, hosted student recruitment events and organized the Skule Lunch & Learn series. He helped establish the Sudbury chapter of the U of T Alumni Association in the 1970s. Constantine has served on the Boundless Campaign Cabinet and the Department of Chemical Engineering and Applied Chemistry Board of Advisors, providing guidance on alumni engagement and strategic direction. He has served as a mentor to undergraduate and graduate students and was a co-founder of the D. Basmajian Graduate Scholarship for teaching assistants. Edward’s experience as a student in the Alumni Mentorship Program was so valuable that he immediately volunteered as a mentor after graduation. Edward eventually became chair of the mentorship program. In this role he introduced novel initiatives and increased program participation. Today, he continues to offer leadership to U of T Engineering as a member of the Alumni Mentorship Program Committee. Over the last eight years, Betty has mentored materials science and engineering students through the Alumni Mentorship Program. 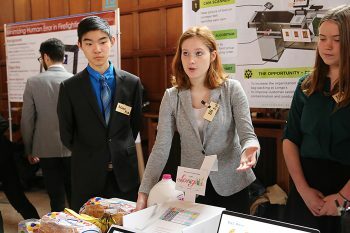 She also served as co-chair of the steering committee for U of T Engineering’s centennial event, which culminated in a wildly successful two-day celebration in the fall of 2013. Betty’s leadership has helped to attract more than 300 community members to the centennial events. She shares her experiences with the Faculty through recruitment events, panel discussions and presentations. 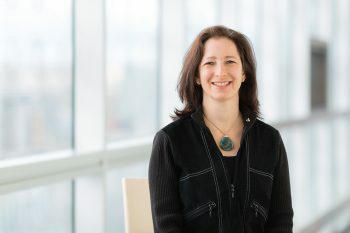 As a successful leader in the field of engineering, Mary is a champion for women in a profession historically dominated by men. Through an article in Impact magazine and a subsequent guest lecture, she has inspired female engineering students to follow their dreams. With her husband she established a scholarship for engineering science students. She has also helped plan and execute events celebrating the centenary of the Department of Materials Science & Engineering. Larry has been an active volunteer with the Department of Civil Engineering for several years, participating in recruitment drives as well as career development sessions for prospective and current students. He is playing a pivotal role in the outreach to his class of 8T8, which will enhance the department’s relationship with alumni and increase participation in alumni events. John is chair of the Department of Mechanical & Industrial Engineering Advisory Board. John also engages with alumni, supports board recruitment for senior volunteers and leads fundraising initiatives for the department. John is also a member of the Boundless Campaign Committee for the Faculty of Applied Science & Engineering. George is the representative for the mechanical engineering class of 5T3. He has been a member of the Skule Lunch & Learn Executive Committee (formerly known as the Class of 5T3 Lunch and Learn). George has volunteered for many years as a registration table host for the Skule Lunch & Learn speaker series. Tom is a 1975 graduate from industrial engineering and has been a member of the Department of Mechanical & Industrial Engineering Advisory Board since 2009. Tom assists with engagement of senior volunteers, is a financial supporter of the U of T Men’s Volleyball program and was a keynote speaker at the 2011 celebrations marking the 50th anniversary of industrial engineering. Learn more about ways you can volunteer at your alma mater.